There are many diagnostic tools and methodologies available to an experienced dentist. From various types of consultation, to intraoral visual checks and radiology. However, for certain purposes, a full diagnostic model of a patient’s teeth and inner oral structure must be taken. A properly taken diagnostic model enables the 3D visualisation of a patient’s mouth in a manner that is highly useful for the prescription of further treatment, whether restorative, infection oriented, or otherwise. 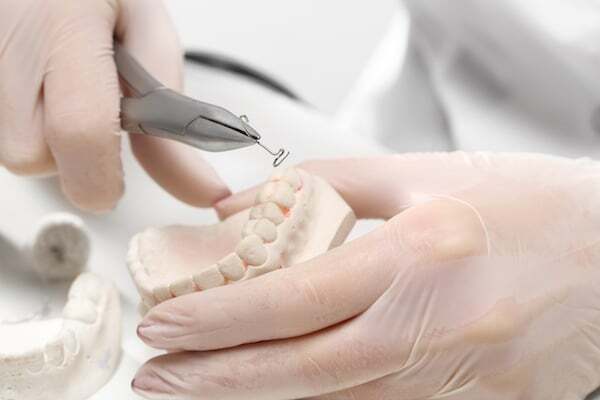 Proper diagnostic modelling, then, can provide benefit far beyond the immediate analysis of structural damage to teeth and the onset of periodontal or gum disease. But what exactly does the diagnostic modelling process entail? The process of diagnostic modelling is usually represented by six key steps. We don’t need to cover all of them here, so below you’ll find a condensed version. If, after a consultation with your dentist, a diagnostic model is deemed the appropriate next step on the path toward optimal oral health, we’ll need to take detailed diagnostic impressions of your mouth. By recreating the entire inner structural environment of your mouth with a putty-like substance of either Alginate or PVS, we’ll be well on the way to a successful modelling. We’ll then need to measure the intricacies of how your mouth relates to the rest of your face, both aesthetically and structurally. This step in the process utilises an instrument known as a face-bow. There is a fair degree more technical detail to the remainder of the modelling process. But to cut a long story short, the process concludes when we mount the model we’ve taken to a solid structure. The final result is one you’ll be quite familiar with: a complete structural model of your mouth, the likes of which you may have seen at dentists before. As mentioned above, the diagnostic modelling process is an important tool in the arsenal of an experienced, full-service dentist. At dhealth Dentistry, we believe that accurate diagnostic models not only enable the prescription of more individualised treatments and procedures, but also serve as a great basis for communication with the patient.